Introduced in 1968, Clinique was the first ever dermatologist-reated, prestige cosmetic brand. Today. Clinique's mission remains what it was from the beginning: to provide the highest quality and most effective collecction of products to enhance every skin type and tone. The brand's customized approach and quality products - all meticulously tested and carefully formulated with the latest science - have made Clinique one of the leading skin care authorities in the world. All makeup and skin are products are allergy-tested and 100% fragrance free. Clinique offers products for men and women of all ages and ethnicities. Clinique is sold in more than 130 countries and territories, and over 16,000 sales locations. This March, get the best of Clinique - free with every purchase worth 4,500Php from Clinique counters. 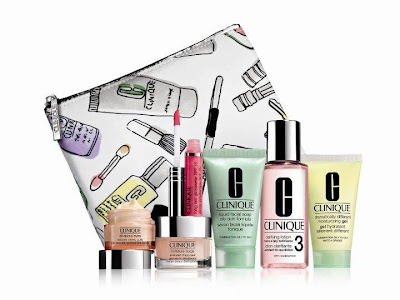 Each Clinique Bonus travel sized best-sellers packaged in a handy cosmetic bag, perfect for your summertrip. Liquid Facial Soap Oily Skin Formula. Claryfying Lotion Twice A Day Exfoliator 3, and Dramatically Different Moisturizing Gel - Cleanse, Exfoliate, and Moisturize daily with Cliniques's 3 Step reimen. The perfect pick-me-up for your eyes. In addition to moisturizing and softening the appearance of fine lines, this treatment is formulated with botanical complex that helps minimize dark circles, as well as grape, mulberry root extract, and caffeine to discourage fluid retention and reduce puffiness. Your skin will never go thirsty again! A lightweight gel moisturizer that quickly delivers 24 hour moisture where it's needed, while taking into account changes in temperature and humidity. The ideal travel companion to have whether you're traveling on planes, trains, or automobiles. Experience a higher level f hydrayion from the very first application. It also dramatically improves skin's natural moisture retention ability for longer lasting hydrayion thoughout the day. True to its name, Longlast Glosswear is formulated with powerful film-formers that create a seal so that the gloss stays put for hours. This high shine lip gloss also provides SPF15 sun protection to help protect lips from the harsh summer sun. I am excited to try this set! It will be a great travel companion this summer. Clinique fans and lovers, grab yourself one of these bag of goodies now while supplies last. Clinique Bonus runs from March 12-31, 2012. Step up your purchase to 5,000 or more, and recerive a silver travel bag with your Bonus. Clinique is available at Rustan's Makati, Rustan's Shangri-la, Rustan's Alabang Town Center, Rustan's Gateway, Rustan's Ayala Center Cebu, Essenses at Powerplant Mall Rockwell, Clinique Trinoma, and Clinique Mall of Asia. Keep yourself updated for their latest products and promos by liking their Facebook Page.